For Ebola Orphans In Liberia, It's A Bittersweet New Beginning : Goats and Soda After being quarantined for weeks, 18 children in Monrovia are ready to go to new homes or reunite with extended family. But it's not all smiles as the children remember the family they lost. 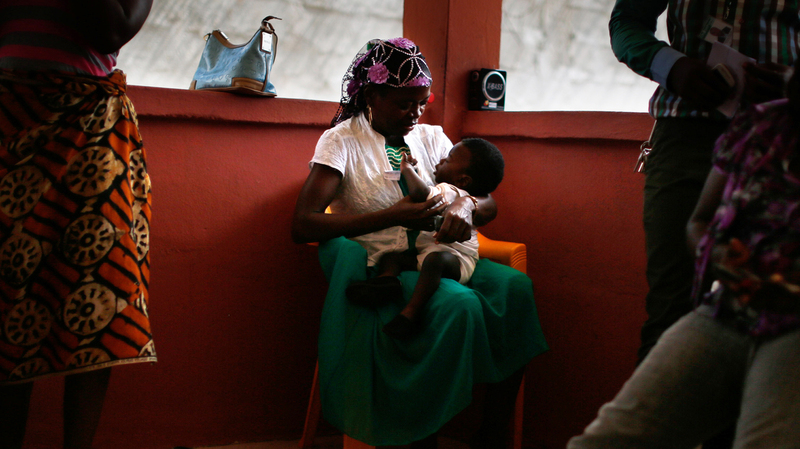 A caretaker holds baby Sekou Dukuly at a shelter run by ChildFund in Monrovia. Later that day, the baby was reunited with his extended family. Ebola has "orphaned" about 2,000 children in Liberia, health authorities say. Some children are being looked after in two shelters in the country's capital, Monrovia. Reuniting the kids with their relatives, or finding them foster homes, can take time. They need more love, definitely. Losing your parents is hard. It's very hard to take, so we need to give them more love. These are kids who have come into contact with sick people but aren't showing signs of Ebola themselves. 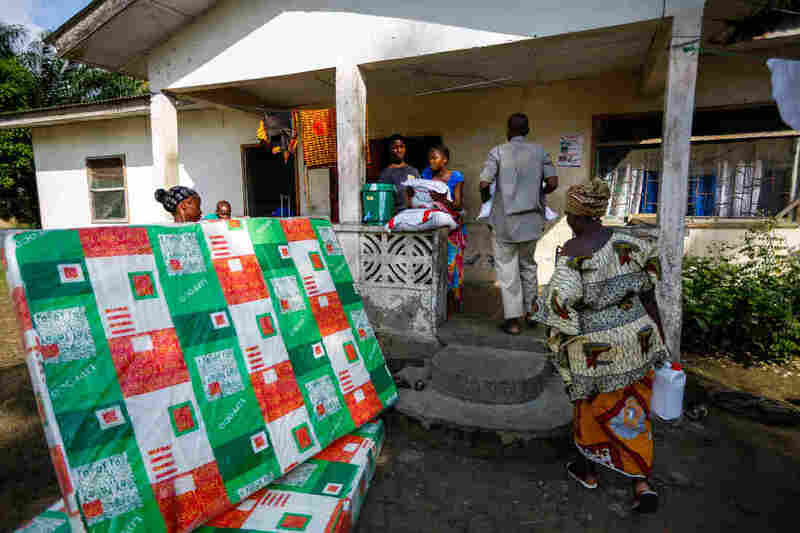 The children must be monitored for 21 days — the cycle of the Ebola virus — in a care center to ensure they are also not infected, says Anthony Klay Sie of ChildFund Liberia, the nonprofit running the shelters. "Children are placed in a group of three. If a child starts to show signs and symptoms of Ebola, that child is immediately isolated," he says. "The entire essence of this center is to help break transmission of the virus within family settings." So far, the shelter has recorded five cases of Ebola among the children, Klay Sie says. Three died, and two have survived. Those who are healthy have to go through a two-stage process before they can be reunited with family. Once they've completed the first observation period, the children move to a second shelter. After at least 21 days there, they are eligible to go to their new home or to extended family. Today is that day for 18 children. Cars wait outside the shelter as Sienna Wisseh, assistant director of Liberia's Family Welfare Division, gives out orders. She is helping to supervise the children's departure. 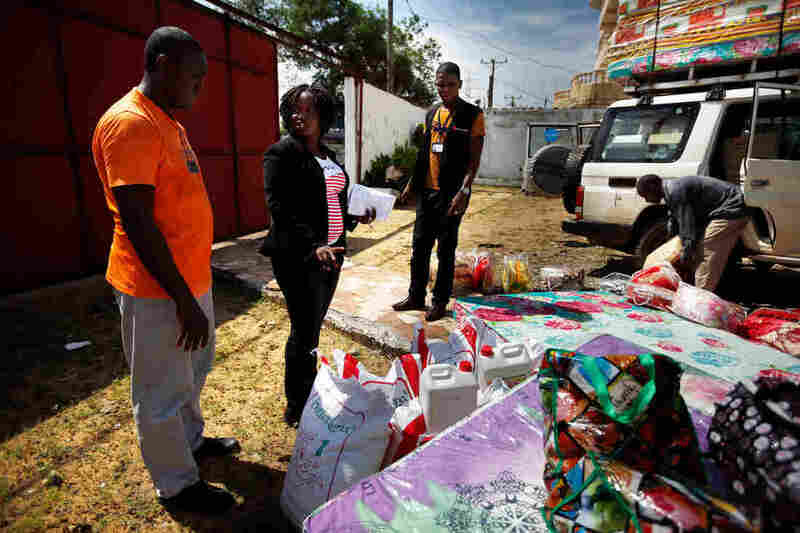 Sienna Wisseh of Liberia's Family Welfare Division (center) directs the packing of supplies that will be given to families adopting or reuniting with children. "The six bags, they go in the car with the children — and a blanket and a bucket, everything," Wisseh tells the staff. Each child is given clothes, toiletries and a blanket, along with about 55 pounds of rice and cooking oil. They're also given colorful mattresses, Klay Sie says. All of the items are part of the reunification packages provided by the government and other nonprofits. "Normally, children who come from a family that had an infected person, their belongings are all burned," Klay Sie says. "So upon their return, they may find it difficult to start life over." Some of the children have been here for as long as two months, like the Togba sisters: 13-year-old Lovetee and 12-year-old Tray. Both are wearing delightful bobble hairstyles and broad smiles. But these turn to nervous, sorrowful looks as the girls remember the loved ones they've lost to Ebola. "We were [a family of] seven," Lovetee remembers. "My father, my grandma, my auntie, my uncle and my brother died." Lovetee calls the uncle who died her Pa, or her father, because he was the one looking after the Togba sisters and paying their school fees. Makutu Jabateh hugs her daughter, Mabana Konneh, 5, as the little girl returns home to her neighborhood in Jacobstown, Monrovia. "The first time I came to this place, I was sad because the place was strange to me," Tray says through Siatta, a Liberian journalist who was with us. "It was just my sister and I." It's a bittersweet moment, says Hawa Sherman, the supervisor of the children's shelters. "I'm very happy, and I'm sad because over the months we have got so used to them," she says. "We are happy because they are going to be reunited with their families, and we will also miss them, too." "They need more love, definitely," Sherman adds. "Losing your parents is hard. It's very hard to take, so we need to give them more love." A family receives a mattress, a bag of rice, cooking oil, blankets and bleach for each child it adopts. When the cars set off, there's a short delay as a couple of the colorful mattresses, heaped onto the roof of one vehicle, get caught on the gate. First stop is Jacobstown, a neighborhood at the end of a dirt road on the outskirts of Monrovia. After the cars arrive, Ebola survivor Makutu Jabateh squeals with delight as she hugs her newly returned 5-year-old daughter, Mabana Konneh. 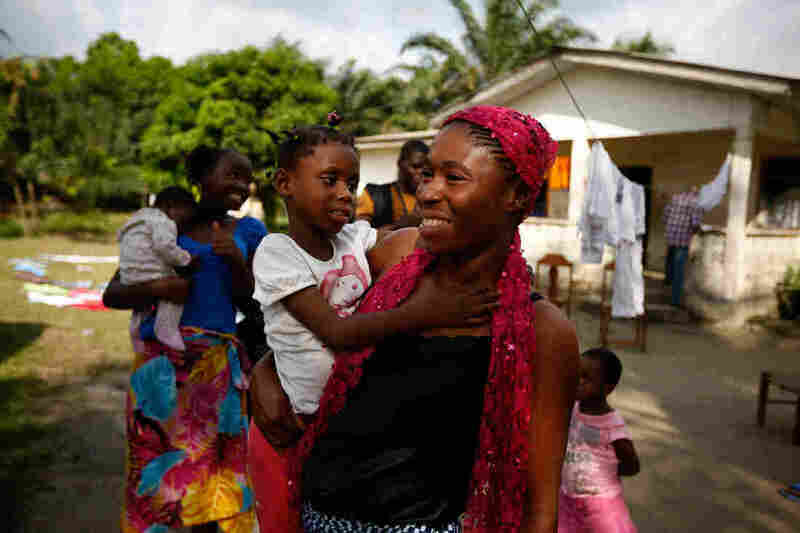 More than 800 children have been resettled in Liberia to date, UNICEF says. The children have to be reintegrated into the community. "So many times, you notice that the communities are afraid of the children," says Sienna Wisseh of the Family Welfare Division. "So many communities don't even want to associate themselves with the children." "Thank you for taking care of my children," Weah Korveh says, as she reunites with her 3-month-old son, Sekou Dukely, in Jacobstown. Korveh recovered from Ebola but lost several family members to the disease. Stigmatization of Ebola survivors and those whose family members have died from the virus has been a problem in Liberia. Jacobstown's community leader, Oscar Wisseh Sr., has a brief word with the small, happy gathering. "We do not stigmatize the parents, and we will not stigmatize the children," he tells them. Then papers are signed and certificates delivered. Ebola survivor Weah Korveh, who lost six family members, has just been reunited with her 3-month-old son, Sekou Dukely. She starts to cry as she thanks those who have looked after her baby boy. "Thank you for taking care of my children," she says between sobs. "So many of my people passed away." Baby Sekou's mother breaks down as she talks, but she gets her message across.